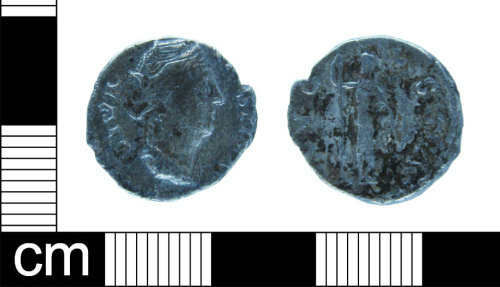 A worn silver denarius of Faustinia Senior, wife of Antonius Pius, who died in AD141. Reece period 7. Obverse shows Faustinia bust facing right. DIVA FAUSTINIA. Reverse shows Ceres standing left holding staff. AUGUSTA. ​The coin is 17.4mm in diameter and weighs 3.0g. Obverse description: Faustinia bust facing right. Reverse description: Ceres standing left holding staff.